Tens of thousands of people gathered in Tel Aviv on Saturday to protest against Israel’s new law declaring it the nation-state of the Jewish people, which has provoked outrage among the country’s most integrated minority, the Druze. Prime Minister Benjamin Netanyahu has defended the law, which says only Jews have the right of self-determination in the country and downgrades Arabic from an official language, from fierce criticism at home and abroad. But his right-wing government has been blindsided by the backlash from Israel’s Druze community which has voiced a deep sense of betrayal over a mostly declarative law that many felt cast them as second-class citizens. The Druze are ethnic Arab members of a religious minority that is an offshoot of Islam incorporating elements of other faiths. Their biggest communities are in Lebanon and Syria. In Israel they number around 120,000 — less than two percent of citizens. But unlike other Arab Israelis, who are mainly exempt from military service, Druze are drafted into the conscript army and widely active in mainstream governance and media, some rising high in the political and military ranks. Packed into Tel Aviv’s Rabin square, protesters, who also included many Israeli Jews, waved Israeli and Druze flags and held up signs demanding the law be rescinded. “No one can preach to us about loyalty and the military cemeteries testify to this. Despite our utter loyalty, the state does not see us as equal,” the Druze spiritual leader, Sheikh Muwafaq Tarif, told the demonstrators in a speech. “Just as we fight for the existence and security of the state so we are determined to fight together for the character and right to live in it in equality and dignity,” said Tarif. Yat Salamy, 53, a Druze teacher, said the law undermined Israel’s character as a cosmopolitan country. “What makes Israel special is its unique social fabric - Jews, Arabs, Druze, Muslims, Christians, Bedouin, Circassians - together we are all Israel,” she said. Arab Israelis make up around 20 percent of the country’s 9 million citizens. Israeli law guarantees them full equal rights, but many say they face constant discrimination, citing inferior services and unfair allocations for education, health and housing. The Israeli left-wing and leaders of Israel’s wider Arab community have also condemned the new law. But criticism from Druze has had more resonance, despite their small numbers, because of their reputation as loyal supporters of the state. In a failed effort to appease the Druze, Netanyahu outlined this week legislation to enshrine their special status within Israeli society, recognize their service to the state and boost funding for their communities. 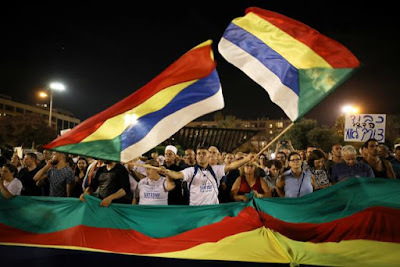 “The feelings of our Druze brothers and sisters touch my heart. I want to tell them: There is nothing in this law that infringes on your rights as equal citizens of the state of Israel, and there is nothing in it that harms the special status of the Druze community in Israel,” Netanyahu said on Sunday.